A brighter future is in your hands. We currently have a full time position available for an Associate Production Manager (APM). The Associate Production Manager (APM) schedules and directs personnel and resources towards providing quality, cost-effective services to our clients. APMs also support the Senior Production Manager in executing day-to-day goals and objectives. Understand client needs via regular communication with the Account Manager or Senior Production Manager. Ensure that job site quality and appearance meet client and BrightView’s standards. Inspect properties prior to scheduled services and prepare specific action plans for service, adjusting service schedules as needed. 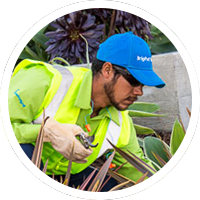 Monitor irrigation systems, identify problems or necessary repairs, and communicate recommendations to the appropriate party. Implement and enforce BrightView policies and procedures related to the proper upkeep and maintenance, storage, use, and training required for branch equipment. Work with the Account Manager to identify staffing needs, hire new crew employees, and prepare daily crew schedules. Hands-on training and support of crew employees, including proper operation of equipment, pruning techniques, safety, and quality standards. Implement methods to improve safe workplace practices and monitor safety records. Maintain and manage all required administrative systems, including time sheets and service schedules. Coordinate with the Branch Administrator to ensure branch databases are consistently updated with current client information. 2-4 years of prior working experience in the landscaping industry or local marketplace or equivalent educational experience.